You can make your own ice princess costumes with a little creativity - and without sewing skills! With sewing skills, the project is simpler but more time-consuming. You can do a bit more legwork and put together the costume pretty easily. The basis of any princess costume is a dress. Since the theme of ice princess costumes is cold, represented by white colors, you will need to look for a white dress. For children or pre-teens going this route, search for a frilly dress intended for more formal occasions. Second-hand costume shops and thrift stores are great places to look. For adults, a basic white dress will work fine; more shimmer is better! The best part about using this type of dress is that you will spend the most on the dress and can use it for everyday wear later. You also should get a piece of white boa or other soft garland from a fabric store. You can use hemming tape or fabric glue (or sew if you would like). Put this piece of embellishment around the bottom hem of your dress and around the sleeves and neckline. By using a pinning method, you can remove it later, and people will see it more as your costume and less as a dress. Because you are creating this costume with just a basic dress, you have to dress up the idea with the accessories you choose to complement it. As any good princess wannabe knows, the key to being an excellent princess is in the accessories. 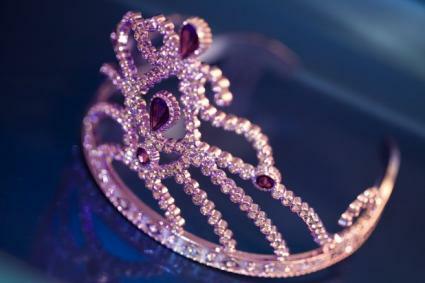 The crown is likely the most important element for girls who are dressing as a princess. Check out discount bridal shops or craft stores for tiaras. Use shining beads or even sequins to dress them up. Mass merchandisers also sell a variety of inexpensive crowns for girls. You can make a tiara or crown pretty easily if you cannot find one ready-made. You will need really sturdy crafting wire. You should fold the wire to the size of the princess' head and attach hair combs with a hot glue gun. Then use craft glue or fabric glue to add clear or iridescent beads to the wire. You can use wire tools to add loops of wire to make the top of the crown and then attach larger gems. White hair is a must for an ice princess. For women with longer hair, using a hair spray is less expensive. These sprays can be purchased for $1 in many places, but you probably have to get them somewhere near Halloween. You simply get someone to spray your hair in short bursts with the aerosol can. Once the night is over, brush out the clumps of spray and then wash normally. A white or silvery wig is an excellent choice as well and is simpler than the spray. A scepter or wand can show that you are not just a pretty face. You are an ice princess with powers! You can get one either at a costume shop or even at a department store. You can dress up an inexpensive cane if needed. Spray paint it white and use it to ward off evil spirits. Get white or silvery shimmer shoes. Sandals work well but can be too cold. Wearing shimmering white hose or even fishnet stockings can add to the legs and feet. An ice princess does not need a cape to work, but it sure makes it a bit more fun. Women who still like the thrill or twirling in a party dress will enjoy adding a cape to the ensemble. Stick with the basics and get a cape at a costume shop. An ice princess is a fun take on a classic costume. Go with the idea and have fun spending your night being cold to other party-goers.